October 23rd has come and gone. I never ever would have thought I'd make it this long. Ever. Mom thought that it was because Joanna wanted to be a Scorpio instead of a Libra. I like that theory. People born when the sun crosses Scorpio generally have a very magnetic and intense personality. Most often get into quarrels and can be very anti-social. They give off an intense love and can be the most affectionate sign. They can be defensive, and thus can get angry easily, but this rarely happens. Their personality is often so intense that they can often be nothing, or they can be everything. Bill Gates is a Scorpio, but so is Charles Manson. They can be artistic and immensely creative and they have good skills, sometimes better than the other astrology signs. There is another phase that a Scorpio can take on: the Eagle; Scorpio in the eagle phase are the wise ones. Eagles soar the sky, seeing everyone else's havoc with his keen and intelligent eyes. Umm.. well, only time will tell! I know nerd runs in our family so I wouldn't mind a Bill Gates. Seems like Scorpios lead an "all or nothing" type of life. 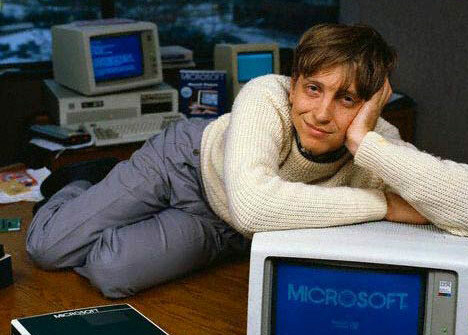 Bill Gates trying to be cool. This is hopefully our very last shopping trip sans a behbeh. And I'm also totally cool with having a C-section. I was definitely having a hormonal moment when I was knitting that scarf. The scarf is complete and I'm now making a headband for Joanna.